Tony Watt must use his Hearts disappointment to finally realise his potential and become one of Scotland’s greatest ever footballing talents. That’s the opinion of the Edinburgh club’s former striker John Robertson, who believes Watt can be one of the finest players ever produced in this country. The 23-year-old was returned to parent club Charlton Athletic six months into his season-long loan at Tynecastle. 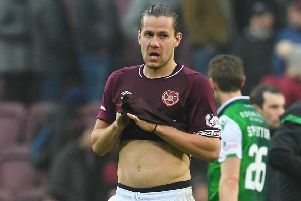 He scored just once in seventeen appearances in maroon and Robertson – Hearts’ record league goalscorer – has advised him to work on being a team player. “I am surprised and disappointed for both it did not work out,” said Robertson, who works at Hearts in a commercial role. “In the first few games he played, he showed the ability he has got is frightening. When he is on fire, he is unplayable. But I’ve told him he needs to play in areas where he can hurt teams. If anyone can into his head and get him focusing and playing football and understanding what he can bring to a game of football, then he can go on to be anything he wants to be. Remember he is still a young kid. “Gordon Strachan has pulled him in [to the Scotland squad] recently and that shows you the talent he has got. He’s a big lad, he’s over 6ft, he’s got strength and ability and goals in him. But it’s at the stage where he and the people who know him need to sit him down and ask him if he knows what he has got – then go and show it.